There’s plenty to talk about this week. It was a tale of two races on Saturday. The Ladbroke Trophy provided a one-two for trainer Colin Tizzard, although his better fancied runner didn’t win. Meanwhile up at Newcastle the connections of Buveur D’Air will have left the racecourse with smile on their faces whilst Samcro’s will have left with a frown. A hurdler who can quicken off any pace is really good horse. Buveur D’Air is such a horse, as he had good turn of foot after the last to storm away from Samcro and win the Fighting Fifth Hurdle. If he’s in the same form, as he was here, then surely he will be winning his third successive Champion Hurdle in March. The winner was giving away race fitness to his main rival Samcro, who looked magnificent in the paddock before the off. Not surprising then that there was plenty of money for the runner-up before the race who was sent off favourite. Surely the Champion Hurdle is off the agenda on the back of this run. He just doesn’t seem to have the pace to beat the best over 2m. He looks like a stayer to me. Connections after the race indicated that Samcro will stay hurdling this season rather than go chasing so will the Champion Hurdle or the Stayers Hurdle be the target come March? At Newbury it was the Ladbroke Trophy. Just twelve went to post for this year’s renewal which is a smaller number than is the norm. The consensus before the race was that wasn’t the best in terms of quality and so it turned out. However, that won’t concern trainer Colin Tizzard who saddled the first two and also the fifth. Sizing Tennessee beat his more fancied stablemate Elegant Escape by a fairly easy 10 lengths. The winner was a trends buster as he became the first horse older than nine to win the race since Diamond Edge in 1981. Despite the small field there was no lack of pace in the race with plenty of horses who liked to race prominently in the line up. Several trainers/jockeys changed tactics and it didn’t suit their horses. 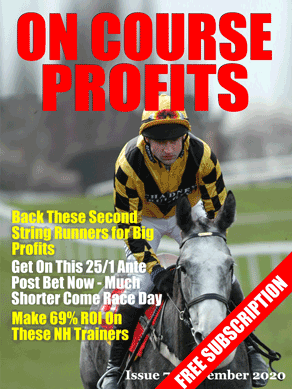 Tom Scudamore on Sizing Tennessee did right thing. He never got involved in the battle for the lead. Instead he kept his horse out wider giving him plenty of sight of his fences. Taking it up four out, he was soon clear of his field and never looked like being caught by Elegant Escape who plugged on for second. The well backed favourite Thomas Patrick and Dingo Dollar had helped to set a strong pace, maybe too strong a pace. Thomas Patrick was a beaten horse four from home and soon pulled up. Maybe something was amiss with the horse as this couldn’t have been his true running. My each-way play in the race Dingo Dollar jumped really well to finish third but probably didn’t stay the 3m 2f trip. Runner up Elegant Escape made to many small errors and would need to jump a lot better if he’s to be considered a Gold Cup contender. He’s always struck me as more a Welsh Grand National type. Sizing Tennessee doesn’t have a lot of mileage on the clock for a horse his age. He seems to have got his jumping right and looks capable of a bit more improvement. If there was a Gold Cup horse in the field it was the winner. However, it’s hard to imagine 11-year-old winning jumps racing's ‘blue riband’ race but then it’s a long time since a 10-year-old won Saturday’s race. So stranger things have happened. On Saturday Racing UK announced that it will become known as Racing TV from January 1, 2019. The name change is happening because 26 Irish racecourses will be joining the channel from At The Races, soon to be known as Sky Sports Racing. Racing TV announced their new Irish presenting team at Fairyhouse. Not surprisingly “The Voice”, Gary O’Brien has switched to the new channel and he will be the main presenter of the Racing TV’s Irish coverage. Along with O’Brien will be Kevin O’Ryan, Kate Harrington, Donn McClean and Ruby Walsh. It all sounds good on paper, with the mooted introduction of a new daily Mark Your Card programme and it will be interesting to see how it all pans out. I got a message last week from Betfair Sportsbook announcing that they have made changes to their Best Odds Guaranteed terms and conditions. From the 29/11/2018 BOG will only be available from 8am on the day of racing. It looks like the bookies are taking a stronger hold of the prices. It will be interesting to see how many more firms follow suit in the coming weeks. Le Musee, trained by Nigel Hawke, is the week’s horse for the notebook. The 5-year-old won a maiden hurdle at Taunton last season. He showed the benefit of his seasonal reappearance when putting up a career best when runner up to the well handicapped Champ in the 2m 4 ½ f handicap hurdle at Newbury on Saturday. The return to softer ground clearly suited the gelding. As did the addition of the first time cheekpieces. He was no match for the winner but was clear of the 3rd. He looks capable of landing a handicap hurdle off this sort of mark in the coming weeks. Well it’s Sandown and Aintree next weekend. Sandown hosts two days racing, including Tingle Creek Day on Saturday. Over at Aintree, we get to see the Grand National fences in action for the first time since April. I don’t think you'll do too badly following those four trainers again this Friday and Saturday. 2:45 – Trainer Sandy Thomson has a good record with his runners at Musselburgh and his stable has been among the winners. He saddles John Williams in this handicap chase. Two of the 9-years-olds career wins have come here, he’s 2 wins from 5 runs 3 placed at the track on good ground and his form figures on good going in races up to 2m 4 1/2 f are 131. The selection is just 3lb higher than his last winning mark and can go well. Racing UK are no doubt running scared at Sky’s intrusion into the market. Nearly every day I get special offers to sign up to their extortionate fees. Let’s hope their prices will now be forced down permanently. Irish racing shooting itself in the foot as usual. Lots of lovely split screen racing outside the big festivals. All for only 3 times the price of ATR. Marvellous.